At The Fireplace Warehouse we are very selective in choosing manufacturers to represent that use only the highest quality materials in their production. One example is this 904 grade solid fuel liner - 125mm (5")). This is the best chimney liner available on the market. Both the inner and outer skins are constructed of 904 grade stainless steel. There are less expensive chimney liners in the marketplace, but, beware, some of the cheaper models may pull apart during the installation process. Twin strip construction (2 x 0.105mm) as well as the corrugated outer wall ensure crush protection when installing this liner. In order to allow for a smooth flow of gasses, the inner wall of this chimney liner is smooth. This feature also helps to prevent soot build up. The sturdy construction of the 904 grade solid fuel liner - 125mm (5") makes it suitable for sustained use when burning cured dry logs, cured dry peat, gas, coal, coke or smokeless fuel. 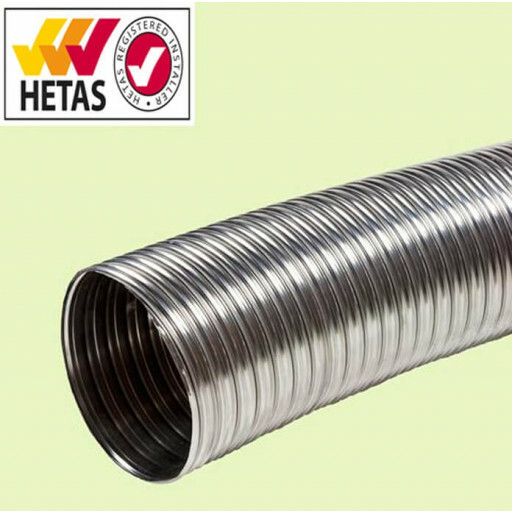 The flexible design of this liner allows it to be fitted easily into virtually any chimney design. The 904 grade solid fuel liner - 125mm (5") is sold in one metre lengths. Please be sure to specify the length you need when ordering. A hacksaw can be used to easily cut the liner to the desired length.